The POC Freezeride Bikercross is on! Sirbikealot Racing is pleased to announce a bikercross event on snow March 20th at Sir Sams Ski Area. 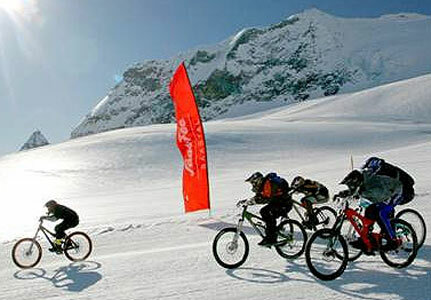 POC, the leader in safety for snow and bike sports will be supplying prizes for the event. All registration will be at the event on Saturday morning. $35 gives riders a full day of riding and racing on a snow built bikercross course, filled with berms, tables and rollers. Don't miss this event, its a great way to get rid of the winter blues and see all your biker buddies. 4. Format it will be a traditional OCA 4X set up with qualifying heats and then a final. All riders will have a minimum of 3 qualifying race runs. 5. 4 Categorie, registration at event only saturday morn.